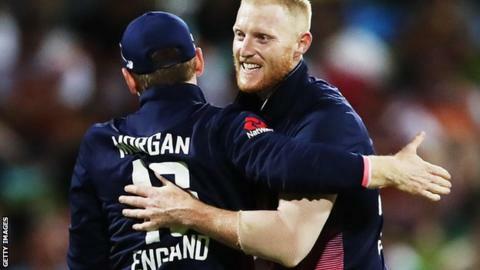 England all-rounder Ben Stokes' bowling was "brilliant" on his return to the side after five months out, said captain Eoin Morgan. Stokes took 2-43 as New Zealand won the first match of the one-day series in Hamilton by three wickets with four balls to spare. Batting at number five, he made 12 off 22 balls in England's 284-8. The 26-year-old missed England's tour of Australia and appeared in court this month on a charge of affray. The first hearing of his trial is scheduled for 12 March in Bristol, although he is not required to return to the UK to attend it. "He adapted really well to the conditions," Morgan told BBC Test Match Special. "I probably bowled him a little bit more than I intended, but he said he travelled really well and clearly he'll pull up a little bit stiffer tomorrow." Stokes played six games for Canterbury in New Zealand domestic cricket during the Ashes series in December. Introduced as first-change bowler in the 13th over of New Zealand's reply at Seddon Park, he generated good pace during a four-over spell that cost only 15 runs. He returned to the attack in the 38th over and claimed two wickets in 10 balls to give England the advantage in a tense finish. Stokes induced a rash swipe from Tom Latham, who made 79, to break a fourth-wicket stand of 178 with Ross Taylor, before having Colin de Grandhomme caught behind with a slower ball. But Mitchell Santner hit 45 not out off 27 balls, winning the game with a six, as New Zealand took a 1-0 lead in the five-match series. "Ben bowled the quickest of the lot. He hit the gloves hard. We saw in the nets he was generating good pace," said England vice-captain and wicketkeeper Jos Buttler, who earlier made 79. "It is fantastic to have him back in all three facets of the game." Taylor, named man of the match for his 113 off 116 balls, said: "It was a hell of a game. England posted a tough total. "The partnership with Tom was outstanding and Sants finished it off - that was the difference." Morgan added: "When we broke that partnership between Ross Taylor and Tom Latham we were in the game, but didn't quite have enough in the tank. "We're going to have to produce different sides of our game to beat this New Zealand side, but tonight certainly we weren't that far off." The second ODI takes place at Mount Maunganui at 01:00 GMT on Wednesday.